Local teen artist, Lucas Duyck, will be exhibiting his work at the Library through the months of August and September. He is a self-taught artist, who has been honing his skills at Glencoe High School. Much of his hand-drawn and computer-enhanced artwork is characterized by colorful graphics, lively characters, and imaginative themes inspired by his favorite anime and manga characters. A reception will be held in Lucas' honor on Friday, August 30 from 6 to 7 p.m. at the Library, and the public is invited to attend this free event. Lucas is a volunteer at the North Plains Public Library and a staff member of the upcoming 2013 Kumoricon, an anime convention held in Vancouver, WA over the Labor Day weekend. He also enjoys reading, gaming, whittling, fishing, and hunting. All WCCLS member libraries will be closed on Monday, September 2nd in observance of Labor Day. Want to check out a book but the library's closed? 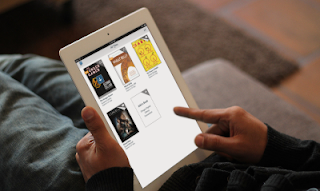 Visit Library2Go to download e-books and audiobooks to your smartphone, tablet and more - 24/7! If you have any questions, please contact your local WCCLS library. WCCLS catalog and online accounts are back up! Thank you for your patience while the WCCLS catalog and online accounts were unavailable for software updates! We are now back up and running as usual. If you are seeing any odd behavior with the catalog or account, please clear your browser's cache. We aren't expecting any problems, but this should resolve any issues. We have information about clearing your browser's cache on your desktop computer and your mobile device on our website. If your browser is not storing your WCCLS barcode and PIN when you log in to your account, clear your browser's cache (see above for info), and then adjust your browser's settings for saving login information. You'll find that at the bottom of this page on the WCCLS website. You'll notice that the look of the desktop catalog has changed a bit. Searching works the same as it did before, but the buttons you're used to may be in a slightly different place. If you want to get deeper into some features of the catalog, we have videos on creating saved searches in the desktop catalog (these alert you to new items added that match your search), as well as creating and managing lists of saved titles. The look of the mobile catalog hasn't really changed. You'll notice more information about titles is now available when you search. What is exciting about the mobile catalog updates is that there is more functionality. You can now update your password, email address, phone number and notification preferences using the mobile catalog. To do this, log in to your account, then tap on Update Account and Preferences, then on the Update Preferences link at the bottom of that page. You can also now create saved searches using the mobile catalog. These alert you to new items added to the catalog that match your search. We have a YouTube video explaining how to do this. If you'd like to create lists of saved titles in the mobile catalog, we have a video showing you this as well. If you have questions about your WCCLS account, please contact your local WCCLS library for assistance. We will be posting more frequent updates about the catalog and account availability on Facebook and Twitter. Starting at 6:00 pm on Sunday, August 18th, the WCCLS catalog and accounts will be unavailable. This is because WCCLS will be performing software updates during this time. We anticipate that the catalog and accounts will become available sometime on Tuesday, August 20th. What will be available during the software updates? What will be different when the WCCLS catalog and accounts are updated? We have videos showing some of the changes to features in your WCCLS account on the desktop and mobile catalogs - find them on the WCCLS website or on YouTube. Thanks in advance for your patience while we work to upgrade our catalog and account software! We apologize for the inconvenience. Attention Library2Go users! 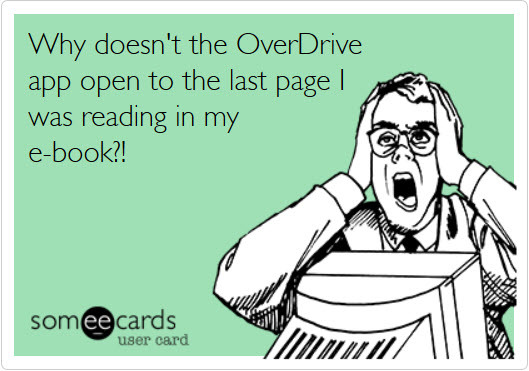 We're excited to share that there are some big improvements coming to the OverDrive app on August 20th. To upgrade to OverDrive Media Console 3.0, you need to have iOS 6.0 or Android 4.0 on your device. Depending on your device settings, your app may update automatically, or you'll be prompted to install the update. If you have an older device, the current app will still work. OverDrive reports they will roll out these improvements for the Blackberry app and Windows Phone in the future. After the updates next week, hopefully you'll never feel like this again! A snapshot of the word cloud from survey comments. See the whole word cloud. 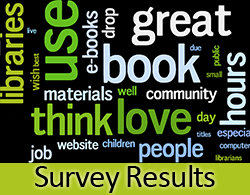 In June, WCCLS did an online survey of Washington County residents. Over 2000 residents participated! What did we learn from the survey? WCCLS member libraries exceed the expectations of 88% of Washington County residents - nearly 9 out of 10. A strong majority of residents (73%) believe that their library does a good or excellent job of managing taxpayer dollars. The majority of those surveyed are increasing their use of e-books and e-resources, at 57%, while 75% of people are not decreasing their use of print materials. WCCLS' Director, Eva Calcagno, notes that "patrons seem to be diversifying how they access information, rather than replacing one format with another," which "mirrors national trends." Want to learn more about the survey results? We have posted the PDF summary on the WCCLS website, and here is a direct link to the PDF of the summary.